After 450 years since they were made, the Flanders tapestries in Badajoz cathedral revive their brilliance by becoming the unifying thread of the international meeting of ‘De Flandes a Extremadura. Humanismo y Naturaleza en los tapices de Badajoz’ (From Flanders to Extremadura. Humanism and Nature in Badajoz tapestries), which is held today and tomorrow in the Badajoz Official School of Pharmaceuticals with the presence of distinguished experts from Italy, Belgium and Spain. 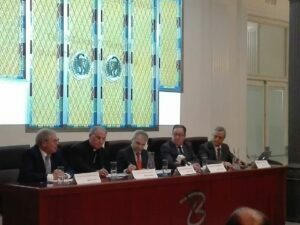 The meeting was inaugurated this morning by the director of the European and Ibero-American Academy of Yuste Foundation, Juan Carlos Moreno; archbishop of Mérida-Badajoz, Celso Morga; mayor of Badajoz, Francisco Javier Fragoso; president of the Badajoz Official School of Pharmaceuticals, Cecilio Venegas and the meeting coordinator, Ignacio López. On this line, the director of the Yuste Foundation detailed that if “Carlos V came to Extremadura to live life, the Flanders tapestries came to show us life portrayed in them”. López explained in detail that there are a total of eight tapestries bought in 1743 and hoarded by Badajoz Cathedral. Seven of them make up the series called ‘La Fidelidad de Penélope’ (Penélope’s Faithfulness), “an exaltation of the universality of love”, and a separate tapestry that represents a beaver hunting scene. López, who carried out a multidisciplinary study with researchers Francisco Mª Vázquez, Alfonso Marzal and Ricardo Kantowitz, pointed out that the seven tapestries in the “la Fidelidad de Penélope” (Penélope’s Faithfulness) series were made by Philip van der Cammen between 1560 and 1570, and designed by Joris Hoefnaguel, whereas the tapestry of the beaver hunt was made during the beginning of the 17th century and created by Martin Reynbouts. This meeting is organised by the European and Ibero-American Academy of Yuste Foundation and has the collaboration of the Mérida-Badajoz Archdiocese, the Badajoz Official School of Pharmaceuticals, the Faculty of Science of the University of Extremadura and the City Council of Badajoz.